Fall is awesome here in the Pacific Northwest. We get a full change of seasons that includes brisk mornings and some sunshine mixed with wind and rain and an amazing collection of colorful leaves. As we settle in to the routines of two new schools and the changes that go along with back-to-school time I'm starting to think about what's next around the house and I'm also thinking about our plans for the holidays. It always brings my focus back home again. I want to re-decorate. I want to paint. I want to get rid of stuff we've outgrown in one way or another. I want to get clear - in so many different ways. Today I'm teaming up with Fab to share a few things I love from their crazy awesome modern collection of goods. I'd love to have a few of these things as easy updates in my house and a few others would make great holiday gifts. 1. World Chalkboard Map | I'm a total fan of vintage pull down maps and I scored one a few years back that includes Oregon, Washington and Idaho. This one would be an awesome decor update in Simon's room. 2. Paint Chip Napkins | We use cloth napkins here at home. These fun modern paint-chip designs would be a great update to the ones we've been using that are really past their prime. 3. Seattle Map | I started a map wall in our tv room/guest bedroom with a fold out couch and this map would fit right in with the NYC and Paris maps. I'd love to have one from each place I've visited (or at least the places that hold special memories for me). 4. Baggu Basic Gold Tote | Total gold fan. This one's for me. 5. Make Mistakes Tee | Also for me. I'd totally wear this. 6. Herschel Settlement Mid Orange Polka Dot Backpack | Anna would love this backpack. This would be a great gift filled with art supplies. 7. Herschel Little America Mid Butternut Backpack | And I'm a yellow fan so this one could also work for her if she needs a mid-year update. 8. The Holstee Manifesto Poster | I've come across this poster multiple times online and would love to hang it somewhere in my house where we'd all see it everyday. I like the idea of having messages like this on the wall that my kids read over and over again as they grow up. 9. Tic Tac Toe Activity Stamp Kit | This would be perfect entertainment when we need a little something to occupy and pass time at a restaurant. 10. My Antonia Book | One of my favorite books with a fantastic cover. Yes, I still buy printed books and I doubt I'll ever stop. 11. Guilford Linen Ottoman | One thing that majorly needs some attention around here is my bedroom. I love my bed but I'd like to have an ottoman like this one at the end of the bed - or at least something that feels grown-up and semi-decorated. I want my bedroom to be a peaceful, restful location. Right now it's still housing office furniture from when we moved all the stuff out of my office back in March. 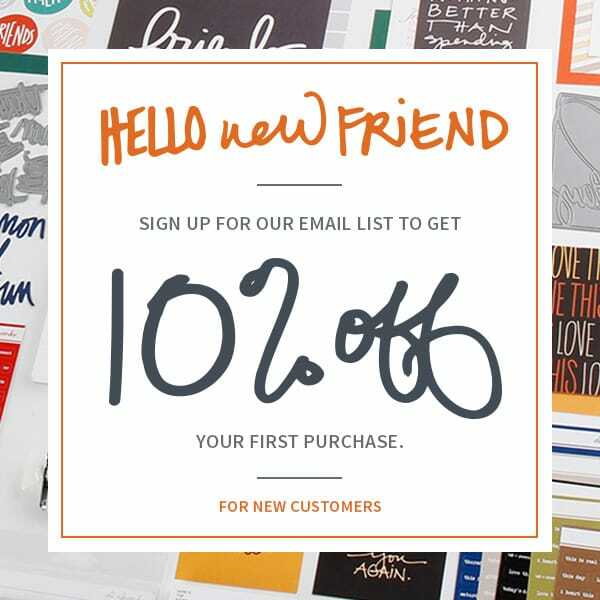 Make sure to sign up for Fab's newsletter to be the first to know about their one of a kind finds. Free shipping and free returns. Not cool sending your readers to a website that requires a log in and will just spam my inbox. Thanks for your feedback Amanda. They follow a model that allows you to choose your email preferences once you sign up and you can always opt-out. Amanda, Ali's free to share whatever she wants on her blog and you are free to click over to the website she's sharing or not. Put on your big girl pants and take responsibility for yourself rather than expecting others to take responsibility for you. I normally do not comment critically, but your comment just really got to me today. Blessings to you, Ali and all who read this site. I feel the quote posters are overdone at the moment but the idea of my kids growing up with a couple of great messages, perfect. I love your perspective! I just crossed Saltwater sandals off my wish list, wonder where I got that idea from?! They are crazy expensive in Australia, $90, but a great durable basic for our summer. OH fun fun stuff. I was very excited when I seen the tic tac toe stamp set. I just purchased one of these while in Florida this last spring. They have a outlet shopping place I LOVE, and my fave store is Fossil store AND I bought it in there. Who would of ever guessed AND it was on clearance. I just bought it because it was SO cute...lol It's really the little things that make us happy...every single day little "stuff"!!! I'd never read Willa Cather. I put My Antonia on my Kindle a couple of weeks ago and it is currently my night time read. I have the Holstee poster in the hallway outside my kitchen. An area with tons of regular traffic. It makes me smile every time I pass by. You'll enjoy it! I love that Seattle poster, especially since it's my hometown. You've inspired me to do a map wall too. Thanks for sharing!!! Love #8!!! I've the Holstee manifesto hanging in my apartment and love reading it over and over. It's such a wonderful, inspiring message. 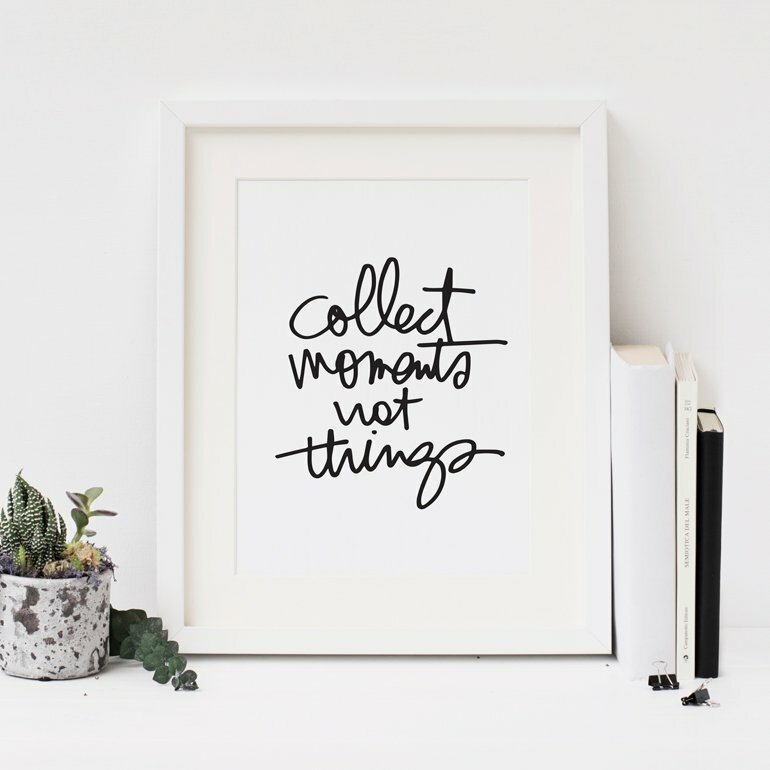 Have the Holstee manifesto hanging in my living room - love! Also adore those napkins. The manifesto poster is full of good stuff. Love that. And the paint chip napkins are just too fun!! TFS! love your comment about your bedroom, how come everything but our rooms get decorated. The part about something grownup is so true, we always get the leftovers! 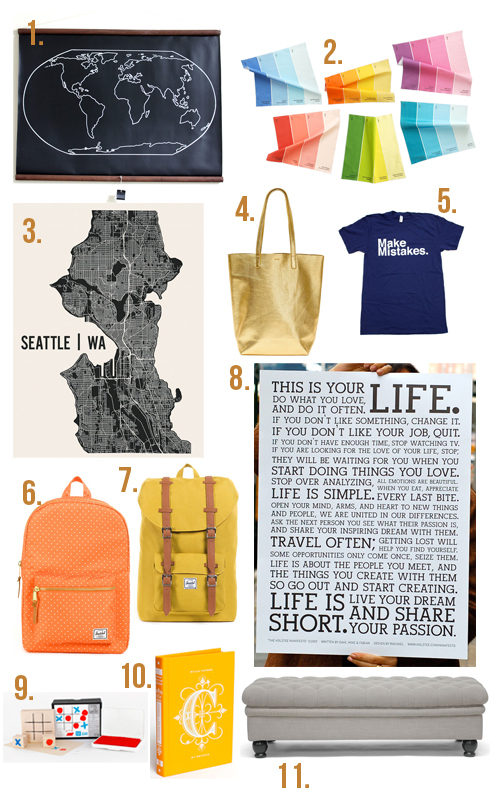 Love these inspiring round ups, Ali :) I love the Seattle Map, pretty cool! These are all great finds! Love the idea of the map wall. And I carry the Holstee Manifesto with me wherever I go! Love it!